HAYWARD | MAYOR | Hayward has two competing but inextricably related problems. One, is a long-held public perception the city is anti-development and, second, it’s a bear for small businesses to set up shop making it difficult for Hayward to create new revenues streams. 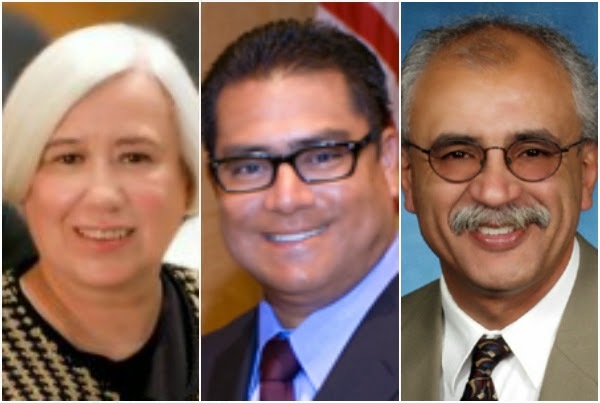 Meanwhile, the entire council, including three running to replace Mayor Michael Sweeney this June have received significant heat from city employees union for successfully imposing a stunning five percent wage on workers to lower Hayward’s rising expenditures. A candidate’s forum Wednesday night saw some softening in their previously hard stances against city workers while acknowledging Hayward needs to become friendlier to business, especially in its flagging downtown. “There’s a lack of vision there,” said candidate and current Councilmember Francisco Zermeno. Earlier this month, he supported a housing and retail project at the vacant Mervyn’s property on Foothill Boulevard, which the City Council turned down. Zermeno said the project could have worked and would have funneled residents to the downtown. Councilmember Barbara Halliday did not directly speak to the Mervyn’s project, but instead said Hayward needs to also maintain its existing big box tenants like Costco and Home Depot, which are tax revenue boons to its local economy. She fears the potential loss of brick-and-mortar stores to online purchases could negatively alter Hayward sales tax dollars while bringing an influx of trucks delivering goods to resident’s doorsteps. Even when business people show interest in Hayward, said Councilmember Mark Salinas, the city shoots them down. He lamented the demise of a proposal two years ago to bring a Walmart grocery store to the long-vacant Circuit City on Whipple Road. “The Council shot it down,” said Salinas. “We strung this guy along for years and it was struck down.” Same with the Mervyn’s project, he added. “As a council, we have to be careful of saying no.” Salinas, born and raised in Hayward, claims some buildings and storefronts in the city have been vacant for decades, some as long as he’s been alive. A member of Halliday’s campaign later questioned the last assertion as hyperbole. However, the Walmart project, which was vehemently opposed by numerous local unions, also reveals the rift between the three mayoral candidates, as members of the current council, and the war of words still being fought with the Service Employees Union International Local 1021, which represent nearly 300 city workers in Hayward. All three candidates attempted to sidestep any direct words toward the union, whose leadership declared last February, “this is war,” after the City Council unanimously voted to impose a five percent wage cut even though the two sides had not bargained since the previous spring. On Wednesday, the trio all offered biographies included their own past involvement in the labor movement. A fourth candidate, Rakesh Kumar Christian, who is concurrently running for governor of California a second time, mixed a platform of anti-government stances with calls for Hayward residents to empower themselves. Halliday, however, mirrored her comments from February regarding the contract talks when obliquely questioning whether the union was taking the city’s stance into account. At the bargaining table, said Halliday, the other side “need[s] to respect that position and understand it as best you can and acknowledge that it’s valid.” Nevertheless, Halliday, who said her grandfather was a labor leader, believes the council’s decision helps guarantee pension promised to workers in the past will be paid in the future. “We do not want unhappy workers,” she added. Posted in Barbara Halliday, candidate forum, Chabot College, Downtown Hayward, economy, Francisco Zermeno, Hayward, June primary, labor negotiations, Mark Salinas, mayor, Rakesh Kumar Christian, SEIU, Walmart. Bookmark the permalink. Vote none of the above! Agree! None of the above, including Christian. He's unintelligible. You show Christian's picture but don't reference him at all. So a professional union like SEIU did not do it do its homework. What a crook coming from Salinas. No comments from the candidates about ways to raise future revenue. Not sure if management unions are the same as teamsters, retail clerks and other real hard working unions. Certainly having a grandfather who was in the union as a connection seems a bit far fetched. Candidates night are a big waste of time. They don't reveal anything meaningful. There's a sentence about Christian. There's an art to fairly condensing a 2 hours, 30 minutes candidate's forum into 600 words. In addition the candidates might want to discuss downtown parking. Once I have suffered through the loop….can't find parking. Their attitude towards their workers doesn't deserve discussion. DISGUSTING. Halliday, Zermeno and Salinas supported the loop. None have come up with any ideas about how to improve downtown particularly with a freeway running through it. Not one idea on solving the impasse with SEIU. No ideas on generating needed revenue. Salinas is sickeningly patronizing with his ” brother/ sister ” comments. He needs to walk the talk. Did Halliday, Zermeno and Salinas support WalMart? Did any oppose it? WalMart eventually destroys cities. It sounds like Salinas supported it. Do any readers know? All three supported Walmart. Peixoto opposed. Also note in the article, Salinas has been saying some buildings in Hayward have been vacant as long as he's been alive since May 2012. News flash for Barbara, if you don't want unhappy workers, negotiate with them. Imposing is a weak, moronic way to deal with your “fellow employees.” Grandpa would not have been proud of what you & the others have done to set back labor relations and kill off what was left of employee morale. Oh and if Salinas was my brother, I wouldn't vote for him either! Salinas' comments that the union didn't do its homework are rubbish. Last year the Mayor and his lackey Mark were projecting outlandish 100 million dollar deficits into the future. Mark followed the Mayor without question, showing no leadership, even as those projections proved to be a figment of Sweeneys imagination. By year end the deficit disappeared and the City finished the year in the black. Beacon economics and an independent fact finder both issued reports with actual, you know, analysis. Mark still chose to attack workers. Did he even read the reports? Can't support Rocky or Sarah because they're whores for the unions. Even though Tavares doesn't like the truth being told. We won't be silenced. Going to keep spreading the truth, over, and over, and over again! A vote for either of them is a vote to pick the public's pockets clean! A 60 million dollar 21st. Century library, an 89 million dollar police station, millions more for new firestations & a training facility. All brought to you by Fran David & the current City Council. Peixoto's biggest supporters are police & fire–yes, unions. Political leeches love spending our hard earned money. Don't know who to support for Mayor as all have flaws. Will be supporting Rocky and Sarah for Council as they are for smart growth along transportation routes that is the wave of the future. The anti-union sexist is Ralph Farias as most of Hayward knows. He has run more than most for City Council and never been successful. He tries to inflame rather than persuade. Hello Hayward you have a 230 million dollar school bond on the November 2014 election which will be $1,200,000,000 or $1.2B as I was watching the last school board meeting. The assault of the tax payer is big time in Hayward. So now let me see Measure A, C, I bond, and now this sales tax measure and another $1.2Billion school bond…yikes!!! Say thank you teachers, and government/city employees everywhere for wall the debt you are making us get. Can't vote for anyone who voted for WalMart and the Loop for Mayor. Do we not have anyone who will stand up to staff.? Fran should be fired for her incompetence.